Experts say these clusters of organ cells will speed development of new life-saving drugs and help doctors customize treatments for their patients. Tiny versions of human organs smaller than a pea are making a big splash around the world — and for a good reason. 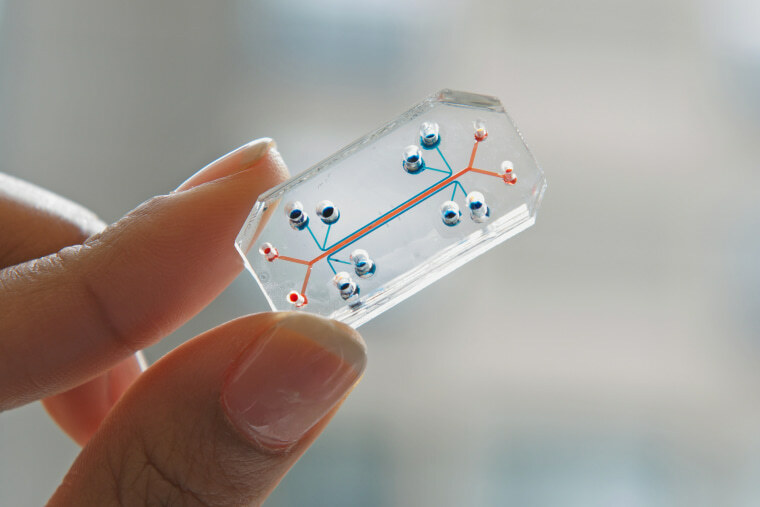 Though the clusters of cells of brain, kidney, or liver aren’t much to look at, experts say these so-called “organoids” and “organs-on-a-chip” are poised to remake the way new drugs are brought to market. Right now, drug development is notoriously slow and costly; bringing a new drug to market can take a dozen years and cost upward of $2 billion. Even after all that time and money have been spent, new drug candidates often prove to be ineffective — or to have dangerous side effects. “A huge percentage of drugs fail even after hundreds of millions or billions of dollars of investment,” says Dr. Donald Ingber, director of Harvard University’s Wyss Institute for Biologically Inspired Engineering and a leader in organ-on-a-chip technology. In fact, only about one in 10 drugs that make it to human tests (after testing in the lab and in animals) wind up getting FDA approval. In addition to making it possible to create better medicines at significantly lower cost, experts say organoids will help doctors customize medical treatments to individual patients and pinpoint the cause of genetic illness. With organoids, drug development should be speedier — a particular benefit if new drugs are needed urgently to curb a pandemic or treat people affected by nuclear accidents or chemical or biological warfare. And then there’s this: experts say organoids for drug testing should reduce our reliance on animal testing. Organoids are typically grown from cells taken from human skin and reprogrammed into a primitive state. With a little coaching to mimic the conditions found in an actual body, these jack-of-all-trades stem cells self-organize into the three-dimensional clumps. The first organoids — of brain and intestinal cells — arrived in the mid-2000s. Since then, scientists have created organoids of many other tissues, including kidney, lung, and breast. Though organoid science is in its infancy, it’s already helping patients. Scientists in the Netherlands are using intestine organoids to help children suffering from cystic fibrosis. Scientists elsewhere are growing mini-livers with the hope that it might someday be possible to cure liver disease not by transplanting an entire liver (which, of course, must come from a donor) but instead by implanting thousands of tiny liver organoids grown from the patient’s own cells. And then there are brain organoids, which might lead someday to new treatments for serious mental and neurological conditions. Still, “It’s a really far, far cry from an actual human brain,” says Dr. Madeline Lancaster, a developmental biologist at the Medical Research Council Laboratory of Molecular Biology in Cambridge, England. As with all organoids, brain organoids lack certain key features of their inside-the-body counterparts, including blood vessels. If organoids hold enormous promise for drug development, scientists say a mash-up of organoids and microchip technology commonly known as organs-on-a-chip, or simply organ chips, might be even better. The chips are plastic wafers, typically about the size of a AA battery, that are laced with channels containing human organ and blood vessel cells. The devices make it possible for scientists to use electrical current, flowing air, and other physical phenomena to make, say, heart cells beat and lung cells respire. These cues prompt the tissues to behave normally or respond realistically to disease. And scientists can use their microscopes to watch these physiological processes as they occur. Ingber and other researchers have started to link multiple organ chips to form what they’re calling human-bodies-on-a-chip. By showing how a new drug might affect the whole body rather than just a particular organ, body chips could do even more to speed drug development. Emulate, a Wyss Institute spinoff, plans to begin selling organs-on-chips and the tech to run them within the next six months. The FDA recently started evaluating how well Emulate’s liver chips mimic human reactions to food and foodborne illnesses. The company is also working with Johnson & Johnson, the Michael J. Fox Foundation, and Merck to use organ chips to advance treatments for blood clots, Parkinson’s disease, and asthma. Meanwhile, German competitor TissUse plans to offer humans-on-a-chip packed with more than 10 organs next year, CNBC reported. Someday you might even be able to safeguard your health with the help of bodies-on-a-chip created from your own cells: doctors could scrape off a few skin cells and use them to create body chips that they’d use to determine which drugs would be most effective should you be stricken by cancer or another serious illness. Meanwhile, Ingber and other researchers are using their bodies-on-chips to examine how body tissue is affected by nuclear radiation, chemical weapons, and deadly germs. “There are a lot of things out there that we just don’t know how to treat because…you can’t test them in humans,” says Dr. Anthony Atala, director of the Wake Forest Institute for Regenerative Medicine in Winston-Salem, North Carolina, who is also developing bodies-on-a-chip. But, of course, these deadly forces can be tested on body chips. The FDA has awarded a contract to Ingber and his team to use their technology to investigate possible treatments for radiation sickness. Eventually, the chips could help us be better prepared for accidents similar to Japan’s 2011 Fukushima nuclear disaster.